Core to my philosophy as a teacher, I strive to create an environment in which I provide the tools and opportunities that will allow students the freedom to explore. I want to provide my students some background and then get out of their way as they build and construct their own knowledge. This year, I have created such an environment introducing Minecraft to both myself and to Quest Academy. Last year, my webcasting partners, Alex Ragone, arvind grover, and I began exploring the role of programming and games on our webcast, 21st Century Learning. It was in the spring of last year that Alex and arvind devoted a show to interview Joel Levin, the Minecraft Teacher after seeing him at the NYCIST fall meeting. While I was not able to participate in that discussion, when I did listen to it, I knew that I wanted to explore how to incorporate Minecraft in the future. I filed the idea in “Follow-up” folder. Now, fast forward to this year. I have moved to Quest Academy, with its preschool (3 year old) through 8th grade population. In November, while researching the great work that Kevin Jarrett had done transforming his computer lab into a STEM lab, I found out that Kevin was going to lead a Minecraft after-school club. Remembering the interview with Joel Levin, I decided that I should really investigate offering a similar opportunity at my school. What truly tipped the balance was gathering registrations for the Students Involved in Technology (SIT) Conference. As the eighteen students began signing up, two groups of our fifth grade students proposed sessions on Minecraft, one describing what Creative Play was and the second on What To Do and What Not To Do In Multi-Player mode. I realized I was behind the students and I began to make plans to offer an after-school special at Quest to allow students an opportunity to teach me about how Minecraft could be used educationally. It was built by teachers for teachers – I love the fact that this was teacher built and tested by Joel Levin, who uses it with his 2nd and 3rd graders. Licensing could be shared – I love the fact that not only are the licenses discounted, but they can be shared. Essentially, you are paying for the number of concurrent users/seats. So if you wanted to use it for a class, you simply buy enough licenses for that class or your lab. These licenses will have generic usernames, they will have to be shared from period to period, and they cannot be transfered to students, as they are the property of the school. 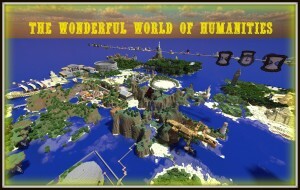 However, they are full licenses of Minecraft and can be used to log into any public server, anywhere in the world. Having this flexibility will allow us to build a MinecraftEdu server or a regular Minecraft server and students will be able to log into them. The MinecraftEdu servertool – There are many reasons to love the Minecraft Server mods that you can purchase. First, you can create a LAN world which students in your class can access even without activating and using the “public” accounts that you have purchased. This allows you and your students to begin jumping into the experience quickly, even as you are setting up and determining how you are going to allocate your accounts. Additionally, there are several server options that you can set. When you start up with world, you can begin using a tutorial world which will help guide players new to Minecraft learn how to navigate in-world. There are also a number of tools which can be helpful for classroom use, the ability to freeze all players, mute their chat, and the ability to bring them all back to the spawn point, the location they enter the world. As a system administrator, you also can give assign everyone a resource, set the mode (survival, creative, or hard-core) for the world to meet the needs of the students you are going to play. A Great Network of Other Educators – Through my research, I have found a wonderful network of other teachers developing for these worlds. One such is Eric Walker, who is a teacher at the American International School in Kuwait. He has created the Wonderful World of Humanities , a world that will allow you to explore a variety of historical areas, from the ancient library of Alexandria to ancient Greece and Rome. There are a series of challenges based material that many schools study within their curricula. The opportunity to flip the roles in the classroom – As I admitted to the students in each of the meetings last week, many of the students, some of the 3rd through 8th graders, had significantly more expertise than did I or the other students new to Minecraft. I have challenged them to become the guided mentors and teachers for the group and have set the expectation that we will all be open and share our learning freely with each other. It is the only way that we all will be able to grow within the game. Last week was the first meetings of the ten week after-school special. In the process, I have learned a tremendous amount about Minecraft. I have created a blog, Minecraft@Quest (thanks for the inspiration, Kevin) to share with others our experiences. This is awesome! Love your thinking and approach! Can’t wait to see where you go with this! I am in the process of “re-imagining” our program for v2.0 – we learned so much in the first one – and some of te lessons were pretty painful! Stay gold! KJ, like in Minecraft, you build to improve what has already created. You helped inspire me and provided the guidance I needed, once again. Thank you. Thanks for the great description of how you are moving forward with Minecraft at your school, Vinnie. I’m curious – what’s the ratio of boys to girls in your after school club? Working at a girls school, I’m wondering if we need to adapt our approach to launching this initiative? Renee, we are currently at 20% girls this spring. I did my best to encourage more girls to participate, but was not successful this time. If I were doing this in an all-girls environment, I would definitely plan on using the Wonderful World of Humanities as a start and then move to a Creative mode world, where students get to build and construct. This may be beneficial to your program. Glad you’re using my world! Let me know how it goes on the Google Groups! Eric, will do. Thank you so much for creating such a rich and wonderful environment.